Parents have expressed anger after President Donald Trump delivered a highly politicised speech to tens of thousands of boy scouts. But his speech to the Jamboree in West Virginia railed against Barack Obama, Hillary Clinton and the “cesspool” of politics, drawing whoops and cheers. The Jamboree of the Boy Scouts of America is held every four years and drew about 35,000 scouts from the ages of 12 to 18 to the latest event, held in Beaver, West Virginia, on Monday evening. 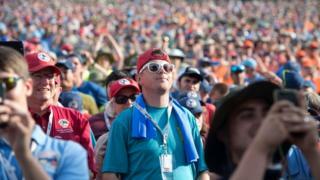 The Jamboree had issued a warning on its blog about being respectful. But in a rambling 35-minute speech, Mr Trump whipped up a response of boos, cheers, chants and jeers as he lambasted fake news, Hillary Clinton’s election campaign and President Obama’s failure to address a Jamboree in person. Responding to the criticism of the speech, the Boy Scouts of America insisted it was “wholly non-partisan and does not promote any one position, product, service, political candidate or philosophy”. It said the invitation to Mr Trump was a “long-standing tradition and is in no way an endorsement of any political party or specific policies”. But the Boy Scouts of America Facebook page carried a number of angry posts. On Instagram, Pete Souza, the former chief official White House photographer, posted a picture of President Barack Obama meeting a scout. “I can assure you, POTUS [president of the United States] was not telling this Cub Scout and the Boy Scouts who followed about his electoral college victory,” Mr Souza wrote. Many parents, lobbyists and politicians took to social media to cite the 107-year-old organisation’s values, and to suggest Mr Trump had failed them. As a Scout leader, my stomach is in knots about what Trump did today. If you haven't watched it yet, don't. It's downright icky. But the tweets were not all anti-Trump, with some praising the scouts for their love of the president. 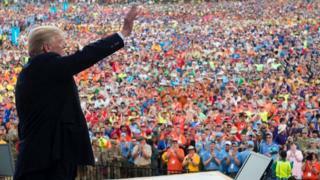 Liberals triggered bigly as Trump speaks the truth to 40,000 cheering scouts. Molding the future leaders. So what were the memorable moments? A familiar point of contention for the president, who was lambasted in the media over his estimation of the numbers at his inauguration address. “Fake media, fake media,” he says, to boos and cheers. Mr Trump says he has 10 ex-boy scouts in his cabinet and in the White House and turns on Barack Obama. “By the way, just a question: did President Obama ever come to a Jamboree?” Mr Trump asks. The audience shouts “No!”. Mr Obama did address the Jamboree by video link in 2010. He was also a former boy scout, unlike Mr Trump. Mr Trump decries the electoral college system but goes through his victories, mentioning state after state to various cheers. He then says he worked hard in Michigan, adding “my opponent didn’t work hard there” which draws boos from the audience. The audience of youngsters is introduced to former boy scout Tom Price, the health secretary. He tells Mr Price he had “better get senators to vote” when a showdown on healthcare comes up on Tuesday. Mr Trump says: “He better get them. He better get them. Oh, he better – otherwise, I’ll say ‘Tom, you’re fired!’ I’ll get somebody”. More applause. “You know, I go to Washington and I see all these politicians and I see the swamp and it’s not a good place,” says Mr Trump. A nod, perhaps, to the James Comey affair. The sacked FBI chief claimed Mr Trump had demanded loyalty from him, something the president denies.